Timex released their Intelligent Quartz Depth Gauge watch a few years ago, but when doing a Google search you will find people reporting they bought one and then never do a review of the watch beyond first impressions. Seeing this I decided to break down and buy one to do an almost true review of this awesome watch that I've been eyeing since its release in 2012. 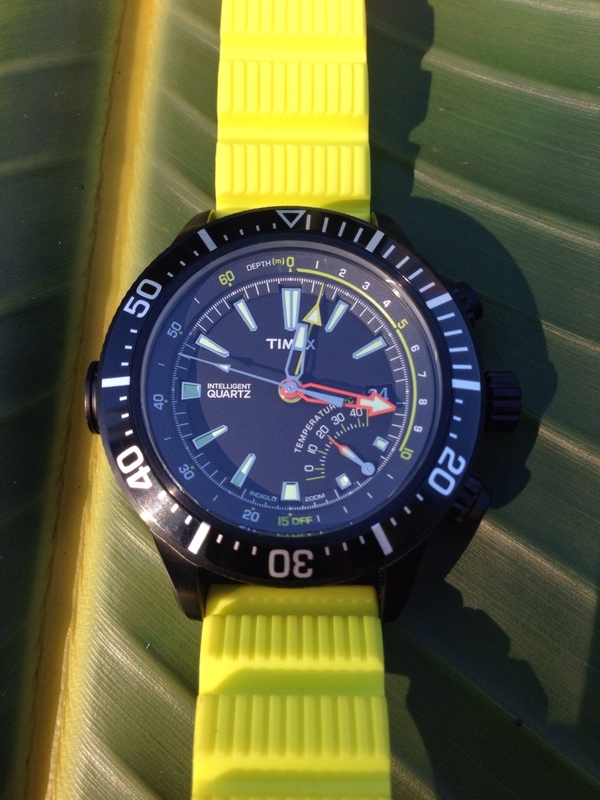 Timex needs no introduction as their origins can be traced back to 1854. Since that time they have always been focused on showing that they offer more ruggedness with the same rate of timekeeping as more expensive Swiss watches. They really became famous for their advertising of mechanical watches back in the 1950s showing watches underwater at drug stores, strapped to the shells of turtles to show their water resistance, and surviving fifty hits strapped to the end of Mickey Mantle's bat during batting practice. Timex continued their ruggedness ads through the 1990s showing their watch can take a licking and keep on ticking. In 2008, or so, Timex decided to make their TX brand that showcased watches that could compete with complications found on high-end Swiss watches with the ruggedness of a Timex. Since that point Timex decided to release those high end complications in the Timex line at a lower price than their TX line as they lacked a sapphire crystal, but contained the same German engineered made in the Philippines movement. The beauty of either line is that they offer the accuracy of a quartz movement with a variety of sensors and advanced microprocessors that drive independent motors for the high end complications. The Intelligent Depth Gauge Quartz line starts at $200 USD and comes in five different configurations of colors for the dial and stainless steel case or black ion plated. They models come with either a non-ion plated stainless steel bracelet or resin dive strap and a mineral crystal. The watch offers a lot of wrist presence as it measures in at 46mm with a height of 16mm with a 22mm lug width. If you include the depth sensor and the crown the watch is 52mm across. The size of the watch makes it sound more of a beast than it is as I find it wears very comfortably thanks to the resin strap and mineral crystal cutting down on the weight of the watch. Legibility is not a problem as the orange minute hand and high polished hour hands are easy to locate with a quick glance. The hour markers also feature a high polished finish which helps make the watch easy to read in low lighting. The luminous material used does glow all night long, but not as bright as bright or as strong as Super Luminova so it can be a little hard to read in the early morning hours when your eyes are bleary from waking up. The lack of a strong glow is not really a problem as the watch features Timex's famous Indiglo with a press of the crown at two o'clock. The watch looks like a chronograph due to the pushers, but I can assure you the watch offers no stop watch function and the only timing is accomplished by the 120 click unidirectional bezel. 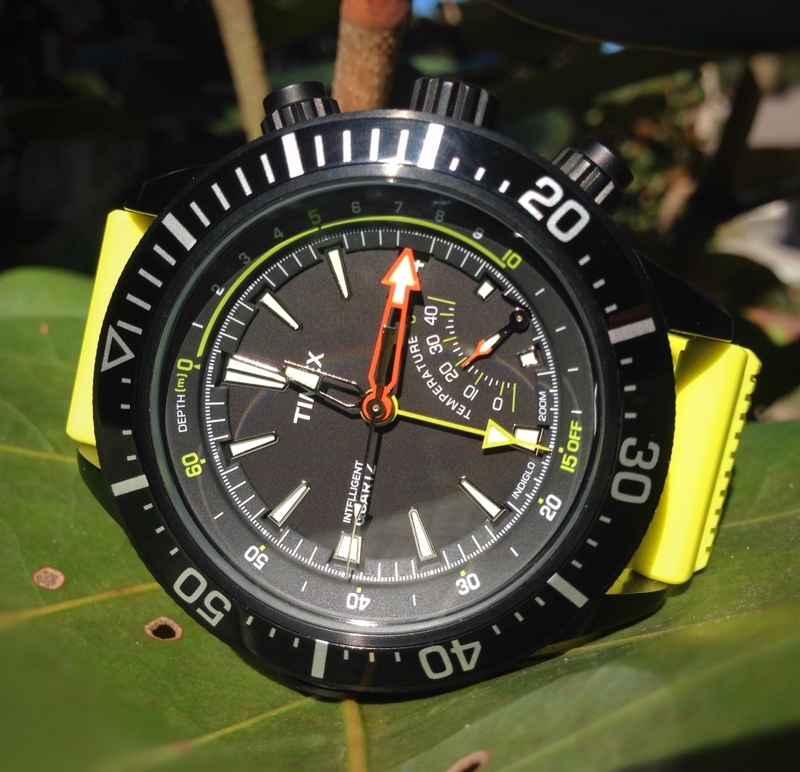 The lack of a luminous pearl on the bezel can be forgiven as the Indiglo feature can be operated under water. The pusher at four o'clock turns on and off depth sensor. 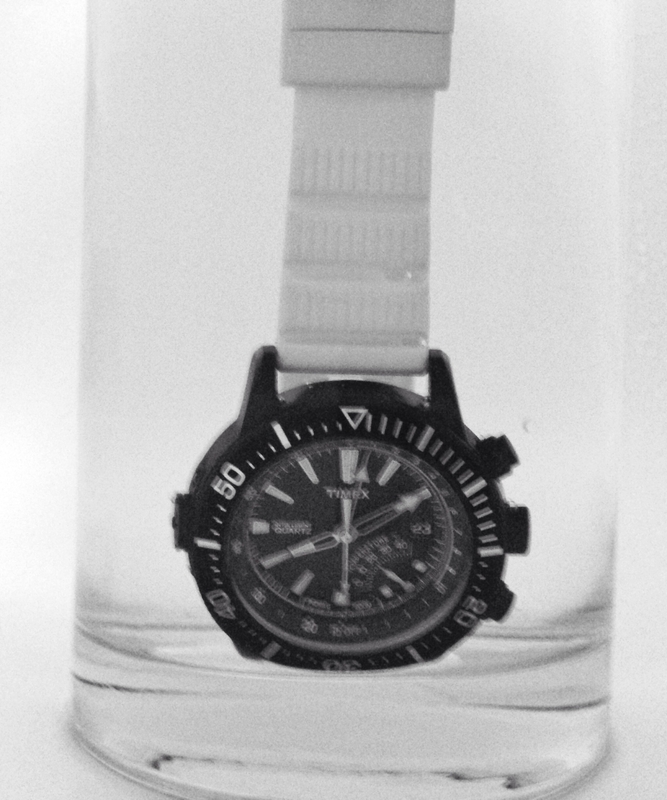 When the depth gauge is not engaged the watch measures the ambient temperature, in Celsius, once every sixty seconds. Body heat throws the ambient temperature measurement off and I have found to get an accurate ambient temperature reading I have to remove the watch from my wrist for about fifteen minutes to allow it to cool down from my body heat. When going for a swim or dive the depth gauge function has to be activated above water by pushing the pusher at four o'clock. When the pusher is pressed the large yellow depth hand moves from the off position at six o'clock to the zero meter mark at twelve o'clock. With the depth sensor engaged the watch measures the depth and ambient temperature once every five seconds. If the watch is submerged to less than two meters within five minutes of turning the sensor on the watch will automatically turn off the depth sensor. If you are using it to see how far down you can go on a single breath you can reactivate the depth sensor by turning it back on again with the watch held out of the water. To turn off the depth gauge when reaching the surface you hold the crown at four o'clock for two seconds and the yellow depth indicator hand will reset to the off position at six o'clock. You can recall the maximum depth and temperature reading by unscrewing the crown and pulling it to the second position of the crown. Timex's literature makes it sounds like you can unscrew the crown when reaching the surface to have the watch recall the information, but I lean on the side of caution and recommend waiting to the watch is dry prior to unscrewing the crown. The watch will store the max depth and minimum temperature reading in its memory till the depth gauge is turned on again. 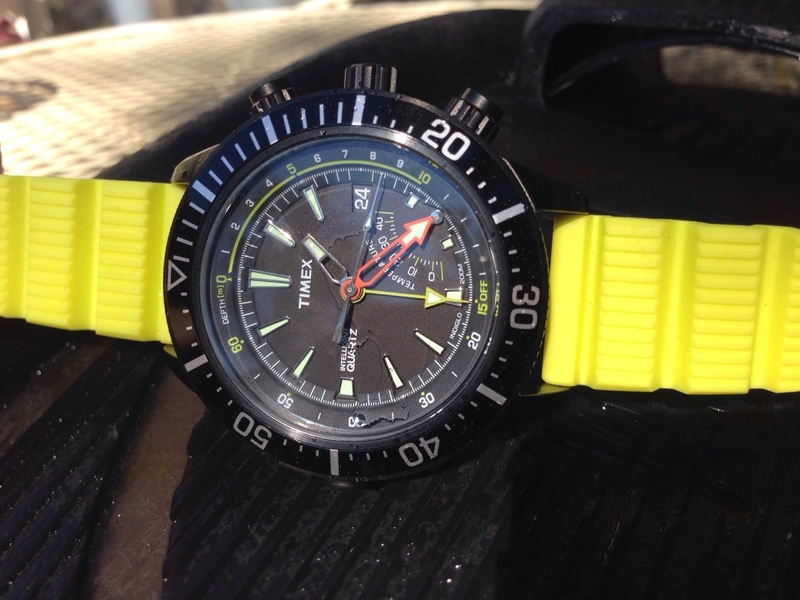 To make this review an almost true review of this awesome watch I of course have to show the depth gauge working in an action photo, but at the time of my writing it is winter time here in the land of perpetual summer which means it's too cold for my blood to get in the water in a pool or the Gulf of Mexico. 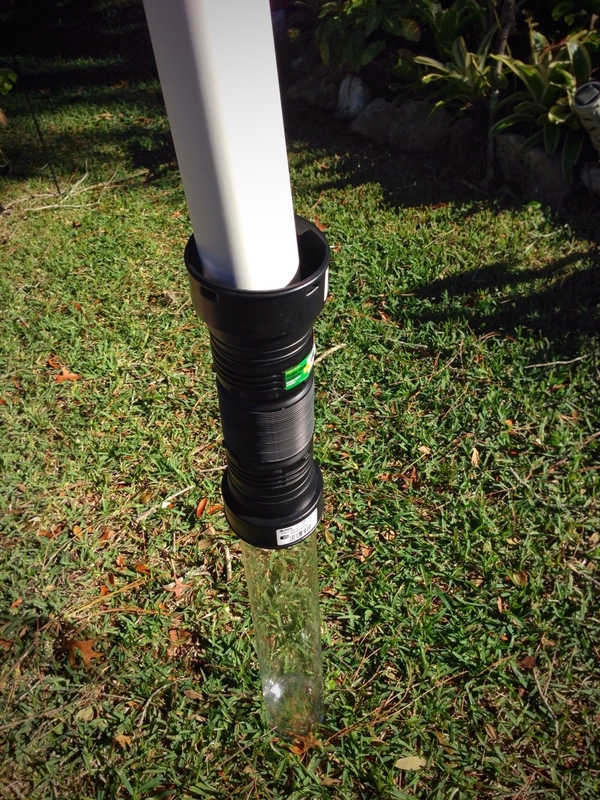 I also lack a camera that works underwater and the only wetsuit I own is a shorty so I had to make a redneck dive tank by getting my four-year old son excited to do a science experiment with the watch and heading to Home Depot to see what we could find for our dive tank using a two foot glass vase I bought for my wife. With the dive tank filled and depth sensor turned on I lowered the watch using fishing line and quickly took an action shot before it took a full reading. I did measure the height of the water in our dive tank and found that the reading on the watch is accurate as was the temperature when compared to the temperature reading on a digital meat thermometer. One of the nice touches Timex did with this watch is that they put a quick no decompression reference chart between the lugs at six o'clock. The guide is easy to see with the OEM band, or a NATO strap, it might be hard to read when the watch is mated to a thick non-OEM rubber strap. A look at the depth gauge on the nine o'clock side of the case with functional screws that are probably used to help hold the sensor in place. According to Timex the battery will last 4 - 6 years with normal use, but I do imagine with the depth gauge being used more often the battery won't make it till the six year mark. 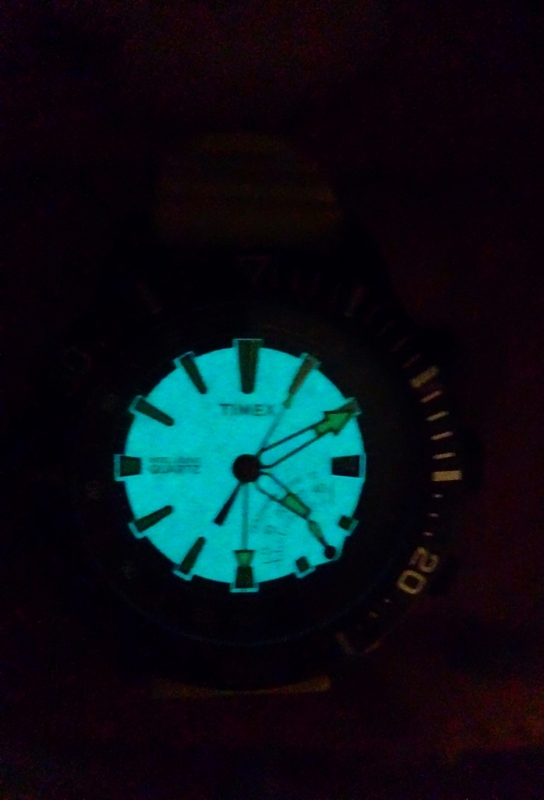 The beauty of it being a Timex you can send it to them for a battery and gasket change and it will probably run you less than $50 USD. The watch comes with a one-year Timex warranty that can be increased for another four years for a price of five dollars USD if you call them within thirty days of purchasing the watch. I've never had a Timex fail within the first five years of ownership, but paying for the extended warranty does at piece of mind when wearing the watch. While you have them on the phone you can also purchase a spare band for twelve dollars USD should the original band ever wear out. All in all this is an unbeatable dive watch that offers a lot of bang for the buck especially at the heavily discounted prices it can be found for on the Internet. 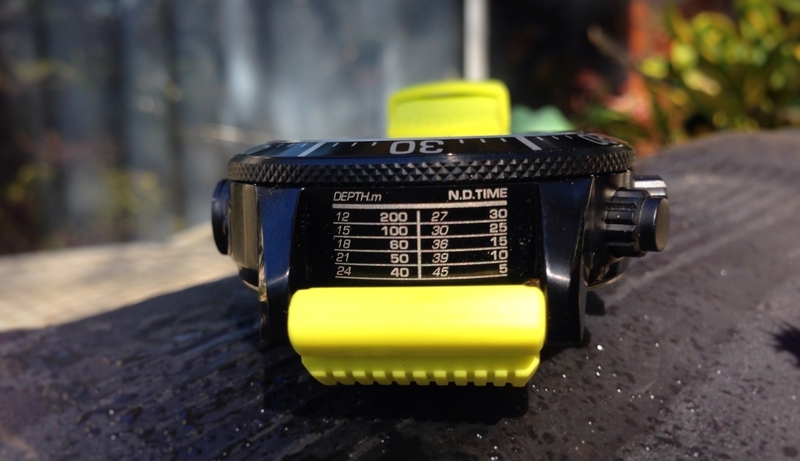 The depth gauge is perfect for open water air divers as the usual max depth is 40m due to the dangers of going deeper. 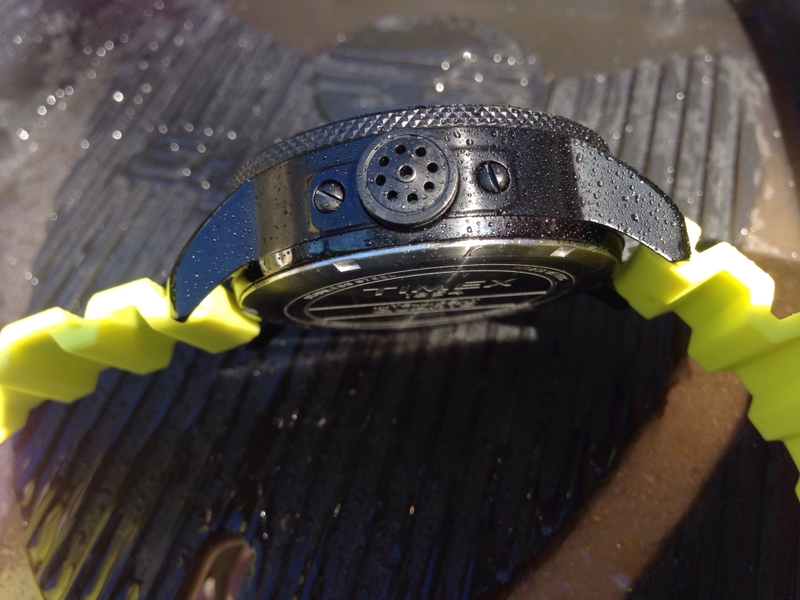 When the temperature of the waters around me increase I will take the watch out in the open water do a follow up post to this review at that time on how the watch did.